Longtime Marketplace partner, iPluggers has completely renewed its look with major improvements to its interface. The iPluggers app is now easier to use and syncing your release to the service only takes a handful of clicks. iPluggers services over 30 thousand FM, AM, local, satellite, digital, in-store, college and online radio stations. 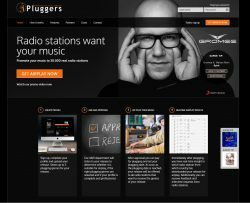 You may already be familiar since iPluggers is used by a multitude of industry labels and artists including Pitbull, INNA, Shaggy, Alexandra Stan, Mario Winans, Tito Jackson, Daddy Yankee and many more. What’s unique is that iPluggers comes with a guarantee on results and the option to set territory restrictions. Additionally, stations can leave feedback about how and where your music landed airplay. With iPluggers, stations can also directly request interviews, if you’re available of course. Keep in mind, labels that sync their releases via The Orchard Marketplace app receive a 20% discount. So get your tunes heard! If you’ve already used the service in the past (whether it was months or years ago), don’t forget that your release will remain available in their system. Radio stations can always browse the iPluggers archives and download releases. Login to the app via the The Orchard Marketplace to see your results. If you have any questions, please visit their updated website here or contact iPluggers via [email protected]. So You're Thinking About Advertising on Spotify?